This is a corner town house from the Wilhelminian Period. It is a kit made of laser-cut cardstock. 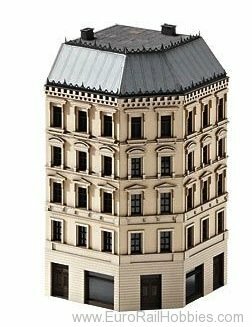 This is a kit of a town house with shops, stucco, and stucco elements. Extensive building instructions are included. Reproduction of metropolitan Wilhelminian Period town houses. Dimensions approximately 82 x 82 x 155 mm / 3-1/4" x 3-1/4" x 6-1/8". This building kit is being produced as part of the Trix theme "Gateway to the World".